After nearly 25 years at Bell, Jon Tatro transferred to another Textron company – AAI – to work on advanced projects such as the DARPA Transformer, Cargo UAS, and the Medium Range Maritime UAS. 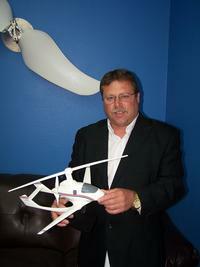 “I took the SR/C technology to AAI after Textron acquired them in early 2008. After a year of briefings to the services and labs regarding the merits of the technology for UAS applications, Textron Systems/AAI elected to pursue an exclusive license for use of the technology.” Jon Tatro joined Carter Aviation Technologies full-time in 2013. DARPA has supported non-traditional companies developing enabling technologies for its larger contract efforts. Carter Aviation Technologies is part of the DARPA TERN (Tactically Exploited Reconnaissance Node) program meant to use smaller ships as mobile launch and recovery sites for medium-altitude long-endurance (MALE) Unmanned Aircraft Systems (UAS).